Input text: a winter backdrop. the shadow plane. a reindeer is left of the man. the maroon sleigh is 4 feet in front of the man. it is right of the man. 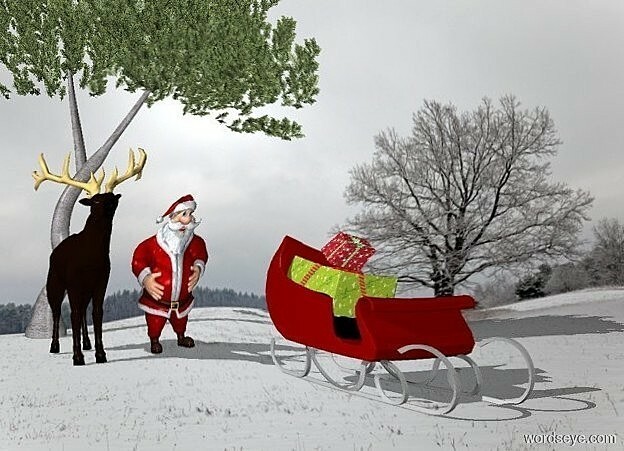 the first gift is on the sleigh. the second gift is on the first gift. the first gift is large. the second gift is leaning forward. the 20 foot tall pine tree is behind the man. I like the shadow plane effect. Please add it to the forum and help pages for the benefit of new users and people who are out of the loop temporarily (like me :-) BTW I really like the scene!! Oh crap, we forgot Ethan in Baton Rouge - now we have to go all the way back. Thanks! Yes, it'll be added to the help pages etc.